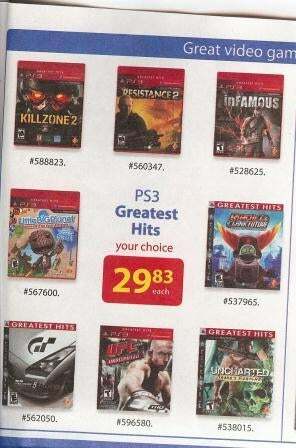 According to this scan from a new Walmart catalogue, Sony has just added some big-hitting new games to its line-up of budget "Greatest Hit" titles for the PlayStation 3. Games like Killzone 2, Resistance 2, Infamous, LittleBigPlanet's fancy Game of the Year edition and even surprise multiplatform hit UFC Undisputed (the latter of which readers are telling us has been available for a few weeks now). As with any other new Greatest Hits re-release, all the above will sell for $30. Yeah, it's April 1, but these are all quite sensible. And it was originally posted earlier in the week. So it smells pretty legit to us.